KleenPure® Swimming and Spa Filters are manufactured with high-quality polyester media ensures durability, clean ability, and efficient filtration performance. The end caps for the Pool and Spa cartridge are made from a durable polyurethane material and are available in a variety of configurations. 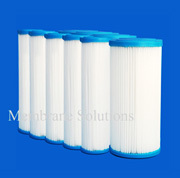 Every KleenPure filter uses our free flow cores which maximizes the life of your cartridge filter and increases water flow. Membrane Solutions is working as a pool & spa maintenance products manufacturer. We are the manufacturer of our own, and have the goal to exploit the market by better price and quality. The production capacity for pool filters is five hundred thousand pieces per year which tops china as far as we known. This enables us to provide better quality with competitive price.